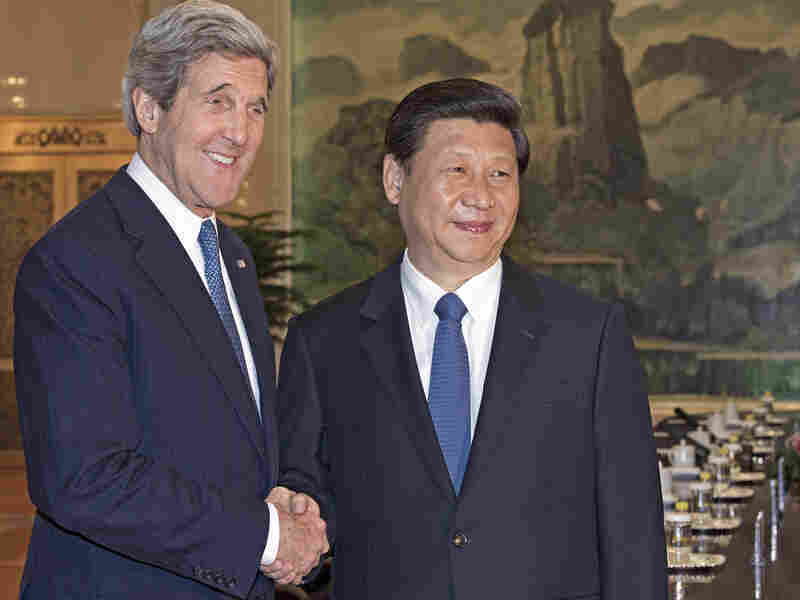 In China, Kerry Seeks Help In Calming North Korea : The Two-Way Secretary of State John Kerry is asking China's government to help ease tensions on the Korean peninsula, where North Korea has issued threats of war as it tests its weapons systems. The top U.S. diplomat met with Chinese President Xi Jinping in Beijing two days before a North Korea-promised missile test. Secretary of State John Kerry shakes hands with Chinese President Xi Jinping before their meeting at the Great Hall of the People in Beijing. Kerry sought China's help in easing tensions on the Korean peninsula. Secretary of State John Kerry is asking China's government to help ease tensions on the Korean peninsula, where North Korea has issued threats of war as it tests its weapons systems. The top U.S. diplomat met with Chinese President Xi Jinping in Beijing just days before a North Korea-promised missile test. "That meeting with the president ran over by quite a lot," NPR's Louisa Lim reports from Beijing. "And afterward, Kerry said it couldn't have been more constructive, and more forward-leaning." The United States and China will "underscore our joint commitment to the denuclearization of the Korean peninsula in a peaceful manner," Kerry said, according to the AP. Kerry has said his goals include getting China to stop the flow of money into North Korea, which operates under international sanctions but counts China as its main economic and political ally. It isn't clear whether Kerry was able to get Chinese officials to promise to apply pressure on North Korea; no details of any possible agreements were released. But as The Washington Post reports, Kerry's bargaining chips in Saturday's discussions included "the possibility that if North Korea gave up its nuclear weapons capability the United States might reverse military moves in the region that have unnerved China, including additional missile defenses in Guam and Japan." Kerry's meetings included a session with Chinese foreign minister Wang Yi, who said, "China is firmly committed to upholding peace and stability and advancing the denuclearization process on the Korean Peninsula." That sentiment isn't a new one for China, as Louisa tells Weekend Edition Saturday host Scott Simon. "China's top priority is stability," she says. "It wants the status quo. It wants North Korea as a buffer state between it and South Korea. So it might not be willing to do anything that might destabilize North Korea." Kerry will travel to Japan Sunday, as his tour of East Asia continues. North Korea's missile test is timed to coincide with the anniversary Monday of the birthday of its founder, Kim Il Sung, grandfather of current leader Kim Jong Un. As the Two Way reported Friday, it remains possible that North Korea's young leader "might soon declare 'victory' and stand down," after U.S. and South Korean military forces conclude joint exercises in the region.